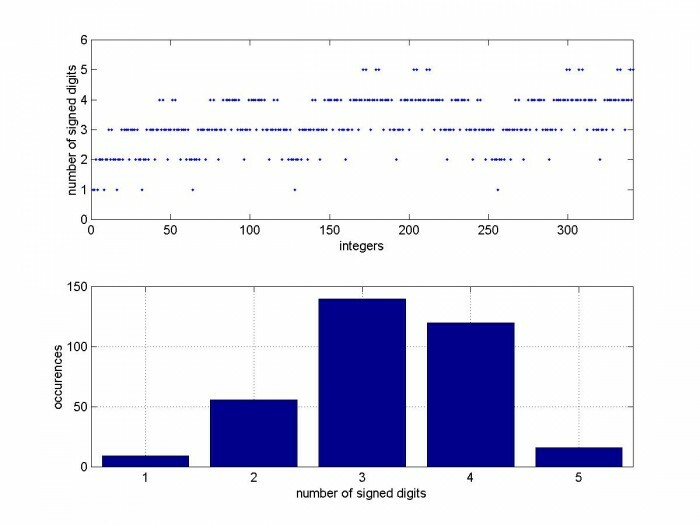 In my last post I presented Matlab code to synthesize multiplierless FIR filters using Canonic Signed Digit (CSD) coefficients. I included a function dec2csd1.m (repeated here in Appendix A) to convert decimal integers to binary CSD values. Here I want to use that function to illustrate a few properties of CSD numbers. 1 0 0 0 0 -1 = 25 - 20 = d31. The reduction of non-zero digits in this scheme allows replacing full multipliers with ones using shifts and adds, resulting in more efficient implementations of FIR filters. 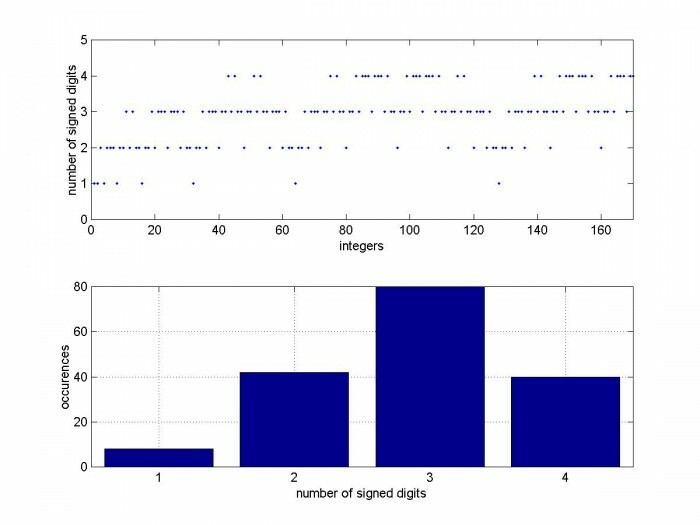 As you can see, the number of signed digits (nsd) for each integer value is either 1 or 2. For integer = 7, the CSD version uses 2 nonzero digits, compared to 3 nonzero digits for straight binary. See example above for integers from 1 to 10. 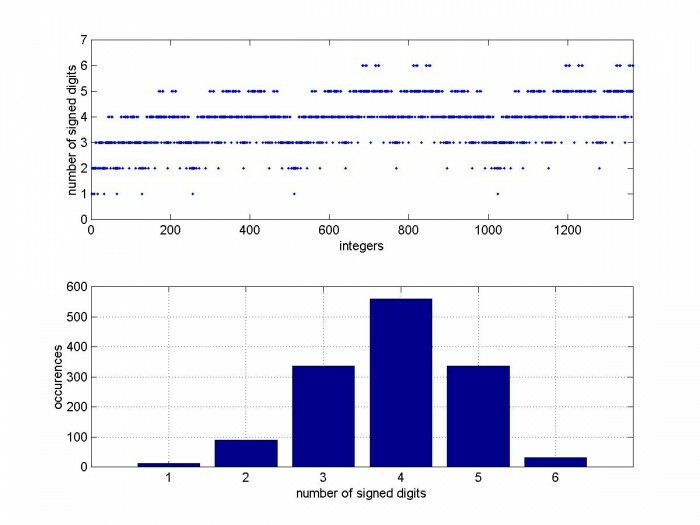 To implement a negative integer, just compute the CSD value of the positive integer and invert the sign of each digit. The largest CSD value is 101010… This approaches 2/3* 2nbits for nbits large. For example, if nbits= 8, the maximum value is 10101010 = 170. 170/28 = 0.664. Nine bits are needed to represent a number greater than 170. As shown above, nsd_max depends on the number of bits. 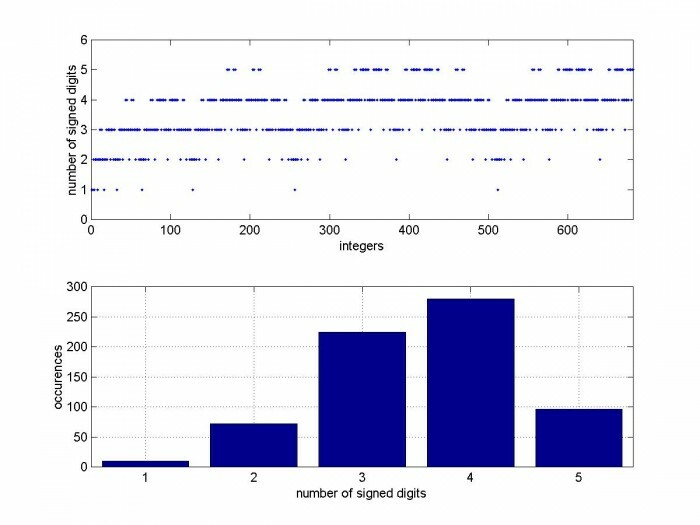 We can also look at the distribution of the number of signed digits for different values of nbits. The m-file in Appendix B computes nsd for every integer for a given value of nbits and plots them. Figure 1 shows the distribution of nsd for nbits = 8, along with a histogram of the occurrences of each nsd value. Figures 2 – 4 show the distributions for nbits = 9, 10, and 11. 1. Scale the coefficient amplitudes, choosing a scaling that minimizes nsd. This is the method used in my previous post on multiplierless FIR filters. 2. Use the approach above, then replace any coefficients bi with value nsd_max as follows: bi_new = bi + 1 or bi -1. By definition, the new value will have nsd < nsd_max. Then compare the frequency response to the response using the original CSD coefficient value. 3. Perform a search over coefficients with lower values of nsd, and optimize the coefficient values vs. a frequency response objective function. This approach is more complicated than the first two, but can achieve more efficient designs. note: max CSD value for nbits = 8 is 170.
note: max CSD value for nbits = 9 is 341.
note: max CSD value for nbits = 10 is 682.
note: max CSD value for nbits = 11 is 1365. This programs is provided as-is without any guarantees or warranty. The author is not responsible for any damage or losses of any kind caused by the use or misuse of the program. A(i,j)= mod(u,2);     % coeff magnitudes note:  MSB is on right.